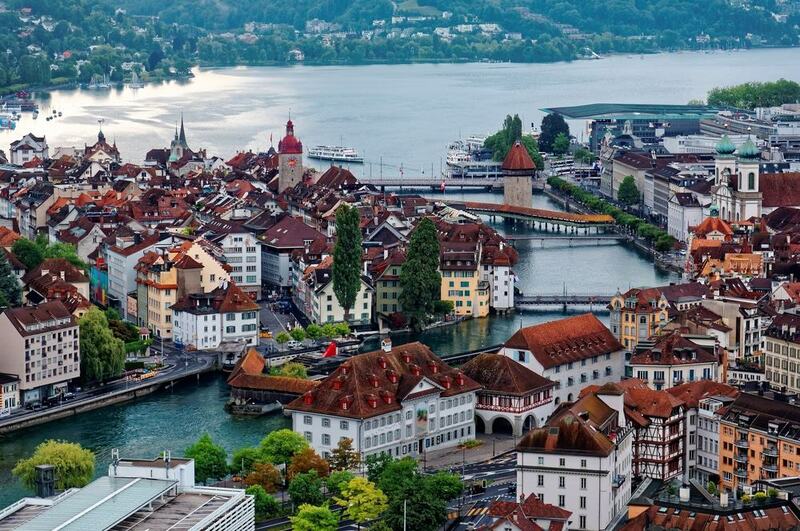 It’s no mystery why Lucerne is so beloved by tourists. 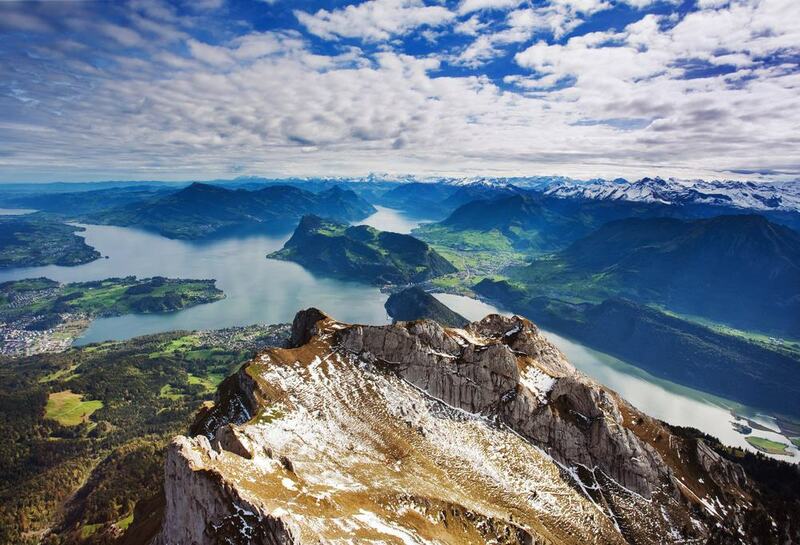 The city rests beside Lake Lucerne, couched in a heart-lifting mountainous landscape. 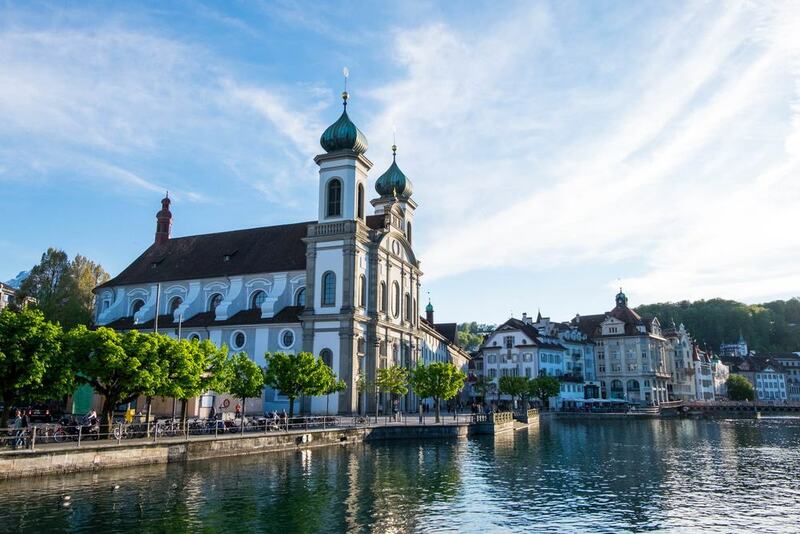 Both the lake and the mountains are at your fingertips, whether you feel like a paddle steamer cruise or want to conquer a mighty Alpine peak like Pilatus or Rigi. There’s also plenty to occupy you in the city, on the historic streets of the traffic-free Old Town, where medieval guildhalls have frescoes on their facades. You’ll venture over medieval wooded bridges with paintings in their ceiling vaults, and scale a line of powerful defensive towers. 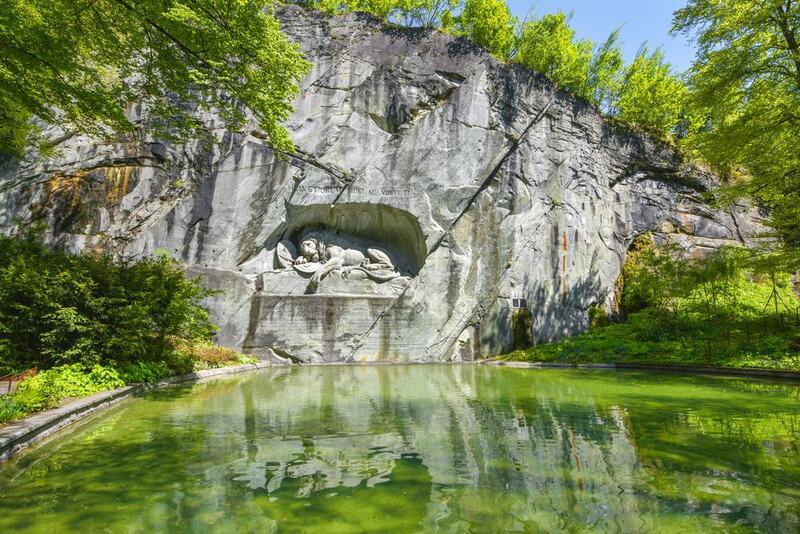 For more recent wonders see the poignant Lion Monument for Louis XVI’s massacred Swiss Guard, and a park of glacial potholes formed during the last ice age. Standing in Lucerne it’s impossible not to be mesmerised by this 2,128-metre mountain to the south. The peak is steeped in folklore, and has the nickname “Dragon Mountain” after a medieval legend claimed it was inhabited by dragons with healing powers. A trip to the top is always an adventure, but could hardly be more convenient. In summer a special loop, the Goldene Rundfahrt (Golden Tour) has been devised, in which you depart Lucerne by paddle steamer. After going ashore you’ll ride the world’s steepest cogwheel railway, with a maximum gradient of 48%. And then after being dazzled by the scenery you’ll catch the new “Dragon Ride” aerial cableway, followed by a gondola cableway back down. 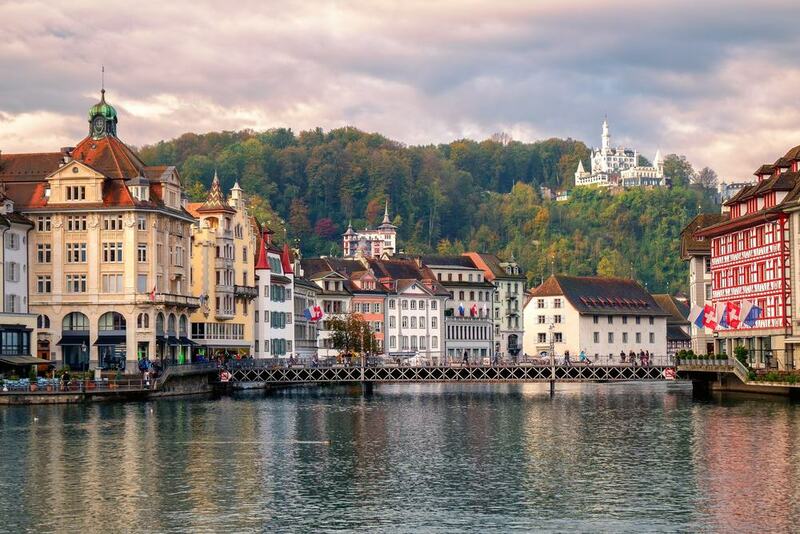 On the right bank of the Reuss, allow as much time as you can to potter around Lucerne’s historic core. There’s a sequence of squares hemmed by tall painted houses and linked by cobblestone shopping streets. All of the old centre is free of traffic, leaving it for the hordes of shoppers and sightseers. Weinmarkt is the obligatory starting point and is walled by medieval guildhalls, some with decorative painted facades. Not far along on Kornmarkt is the Renaissance Altes Rathaus (Old Town Hal), built at the start of the 17th century and with lovely arcades on the ground floor. 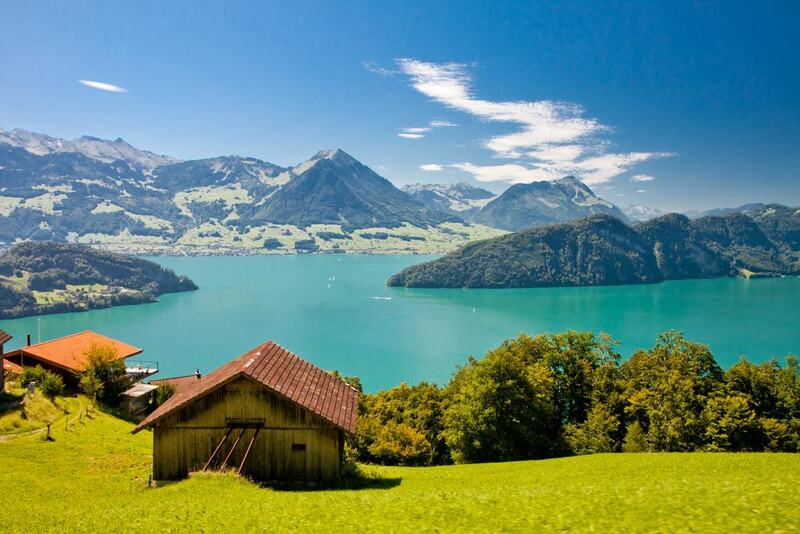 Known as the “Lake of the Four Cantons”, Lake Lucerne is a stunning body of water with an irregular shape that invites you to explore. The lake has four arms going off at sharp angles, with epic mountains on all sides. 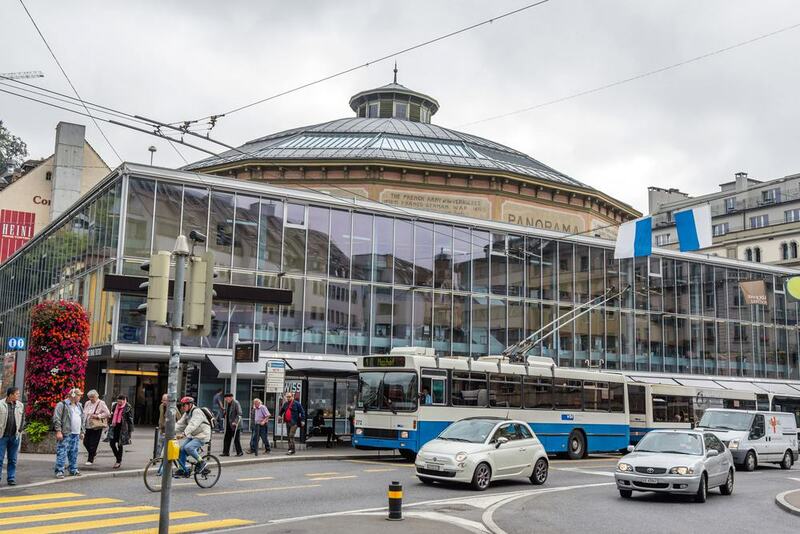 Lucerne sits in the northwesternmost nook, and you can make for the Luzern Bahnhofquai to catch one of five early-20th-century paddle steamers for cruises on the lake. On land, Lucerne’s waterside neighbourhoods were reconfigured in the 1880s to take advantage of the landscapes. 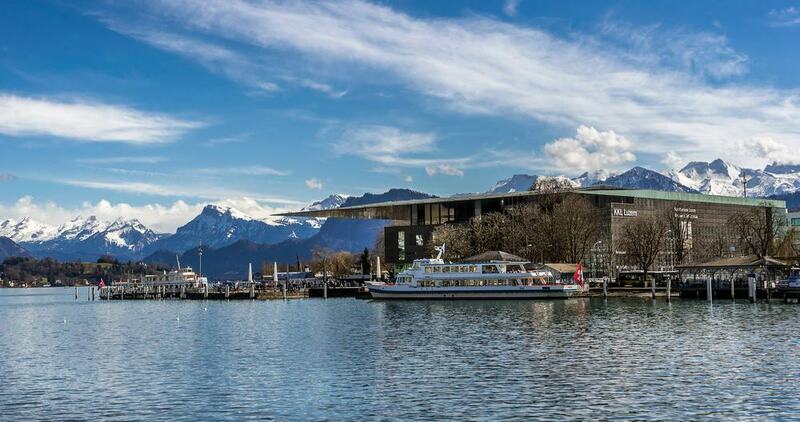 The Nationalquai and Schweizerhofquai are refined, leafy promenades traced by mansions and where you can contemplate the lake and alpine peaks like Pilatus and Rigi. 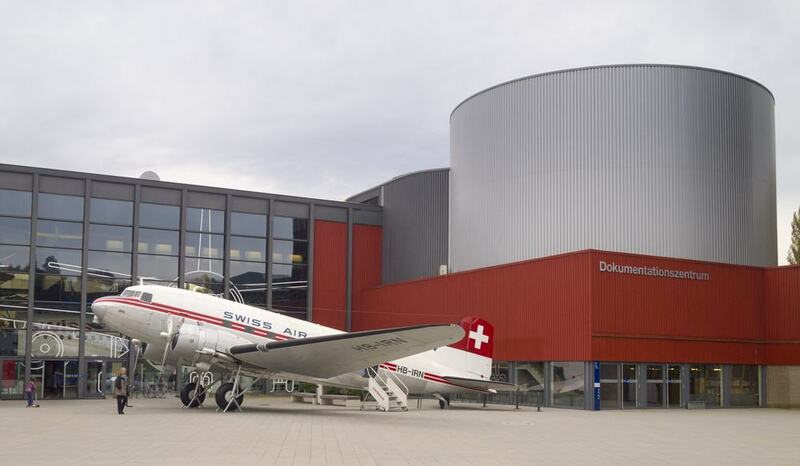 The most-visited museum in Switzerland is a great deal more than just a collection of vehicles. At the Verkehrshaus der Schweiz by the water, this is a self-contained world of transport. There are trains like Switzerland’s first diesel locomotive, 30 aircraft and the Autotheater, an astonishing attraction where a fleet of cars from all eras are stacked six-high on shelves as if they were toys. But the vehicles are only one side to the story, as there’s also a newly updated planetarium, Switzerland’s first IMAX theatre, a 1:20,0000 scale photo of Switzerland from space and the new Swiss Chocolate Adventure for chocoholics. Crossing the Reuss at an angle is the world’s oldest surviving truss bridge, and Lucerne’s emblem. The covered wooden bridge dates from the 14th century and runs diagonally for 200 metres. In the ceiling pediments are triangular 17th-century paintings depicting events from Lucerne’s history. There are 30 in all and used to be many more before a fire destroyed most of the bridge in 1993. The 35-metre tower that completes this ensemble is planted in the water and predates the bridge by about 30 years. You can’t go up, but it’s a sight to admire and there’s a souvenir shop on the ground floor. The art dealer Siegfried Rosengart rubbed shoulders with modern painters in the first decades of the 20th century. Together with his daughter Angela he gathered one of Europe’s richest modern art collections, comprising hundreds of works by artists like Chagall, Monet, Matissse, Miró, Braque and Fernand Léger. But it’s the trove of pieces by Picasso and Paul Klee that are the crowning glory, and have been given special attention at this museum in the former National Bank building. The museum was opened by Angela in 2002 and displays more than 300 pieces at any one time. Carved into a former sandstone quarry is a rock relief of a dying lion. The monument was designed by the Danish sculptor Bertel Thorvaldsen and hewn in the early 1820s by Lukas Ahorn. The lion represents the Swiss Guard, which was massacred while trying to protect Louis XVI at the Tuileries Palace on 10 August 1792 during the French Revolution. There’s rich symbolism in the work: The lion rests on top of a broken shield with the fleur-de-lis of the French royalty, and behind him is another intact shield with the Swiss coat of arms. Get here early in the day to avoid the crowds. Near the Lion Monument is a natural site that dumbfounded scientists when it was discovered in 1872. There’s a group of potholes that were formed during the last ice age 20,000 years ago. And much older than these are the fossils of shellfish and palm fronds from when this spot was the shore of a subtropical sea some 20 million years ago. These natural phenomena are complemented by new hands-on exhibits, as well as an 18th-century relief model of Switzerland. And see if you can solve the Alhambra mirror maze, made with 90 mirrors and dating to 1896. From there, take the “Stone of Time” path to the observation tower, treating you to knockout views of Lucerne and Mount Pilatus in the background. 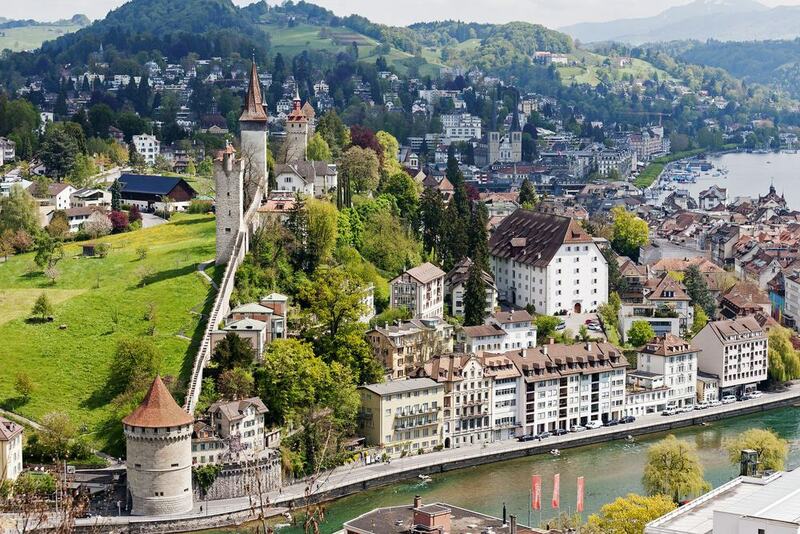 As we see them now, Lucerne’s city defences were raised at the end of 14th century and defend the old town on the sharp slope to the north. It’s a breathtaking sight, as there are nine tall towers in a row all divided by a length of the of the city wall. Four of them are accessible, including the famous Zytturm, which holds the oldest clock in the city. This dates to 1535, and it honour of its age is permitted to chime a minute before Lucerne’s other clocks. The other three towers are all worth scaling to survey the city and lake. Lucerne’s medieval Romanesque basilica was burnt down During the Thirty Years’ War in the 17th century. So while the war was still raging in the 1630s the city built its new church, and it was one of only a few churches to be erected north of the Alps in that period. The architecture is in the late Renaissance style, but there are elements from the original church, like the pair of towers and some medieval and Renaissance ornamentation in the interior. On the north side of the nave is the polychrome Maria-End-Altar, which was rescued from the fire and was crafted in the 1500s. It shows a dying Virgin Mary surrounded by the Apostles. From the time of the 17th-century rebuild check out the black marble high altar and the exceptional carved wooden choir stalls. In 1865 after his affairs had got him into trouble, Richard Wagner was forced by Ludwig II to leave Munich. The king set him up in a manor house in lakeside parkland in Lucerne’s Tribschen district. Wagner lived in the house for six years, during which time he began Götterdämmerung and wrote Die Meistersinger von Nürnberg. 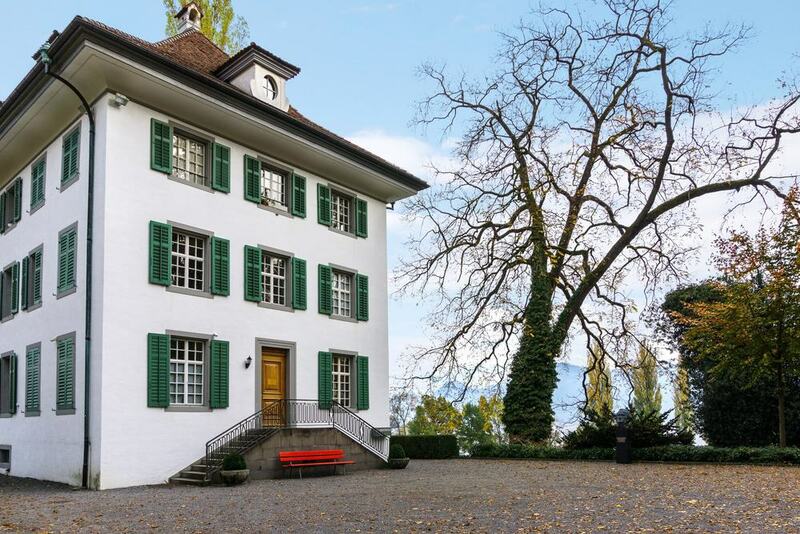 The house is now a museum about Wagner and his time in Lucerne. There’s correspondence, musical manuscripts, furniture, paintings and photographs to browse. But the best bit is the Erard piano on which he composed his masterpieces. 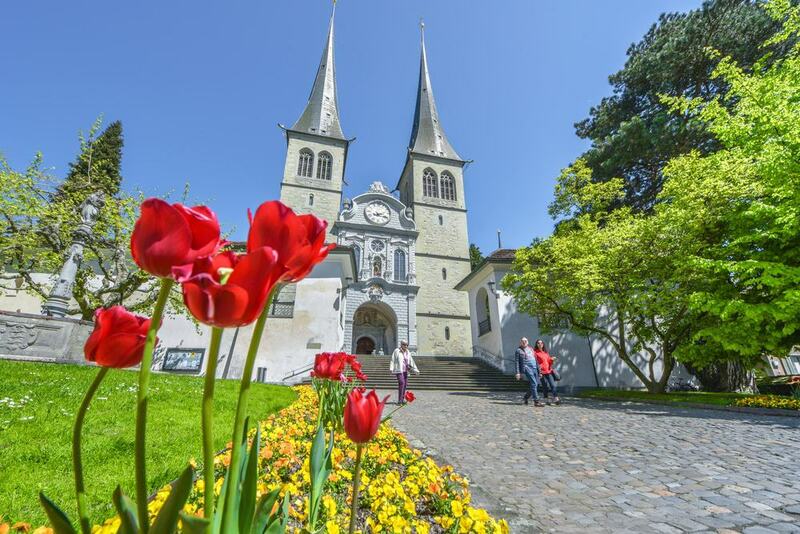 This church was built just a few decades after the Hofkirche, and has an eye-catching Baroque style as a beacon of the Counter Reformation in the face of protestant cities like Geneva and Zürich. The Jesuit Church was designed by architects from Austria and Italy, consecrated in 1677 and completed over the course of the 16th and 17th centuries. Inside, the ornate stuccowork in the side chapels is the earliest example of the influential German Wessobrunner School. The second side chapel is dedicated to the hermit and now saint, Brother Klaus, and you can see his 15th-century vestments. Where the Reuss flows off the lake is jaw-dropping piece of modern architecture. The Lucerne Culture and Congress Centre was drawn up by Jean Nouvel and took shape between 1995 and 2000. The feature that will catch your eye right away is the colossal flat roof pushing out over the waterfront. Underneath it is a complex dominated by first-class concert hall, which has 1,800 seats and the best acoustics you could hope to experience. The Lucerne Art Museum is also inside and has works from the Renaissance to the present. Day or night you can also grab coffee or a bite at the unfussy World Café, which has warming stews in winter and ice cream in summer. 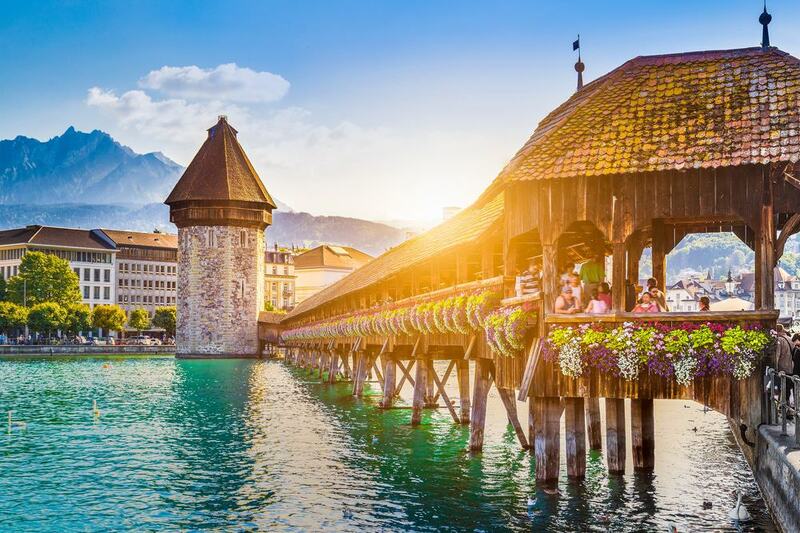 Lucerne has a second medieval bridge downriver, against the western corner of the Old Town. The 15th-centtury Spreuer Bridge is in the same format as the Chapel Bridge, featuring a roof, truss design and more 17th-century paintings on its ceiling pediments. Painted between 1616 and 1637 these depict a Danse Macabre and each image is accompanied by a description and details of the donors. Carry on downriver for a moment and you’ll come to the Nadelwehr (Needle Dam). The river’s history of floods was consigned to the past in 1852 when this dam was installed to maintain the level of the lake. It’s an ingeniously simple system, involving wooden planks (needles) that are added or removed to regulate the flow on the Reuss. Near the Lion Monument and Glacier Garden on Löwenplatz is a visitor attraction now almost 140 years old. The Swiss artist Édouard Castres painted a panorama of a defining moment in the France-Prussian War at the start of the 1870s: In a snowy landscape, the defeated French army trudges into Switzerland for refuge. The painting measures 112 metres by 10 and is displayed in a rotunda. Castres had worked as a Red Cross volunteer during the war so could draw on firsthand recollections for his painting. There’s a small museum at the Bourbaki Panorama, offering some context about the painting and the war.